Trenbolin (Trenbolone enanthate) Alpha Pharma – an anabolic and androgenic steroid, also known under the trade names Tren, Finaplex, Finadzhet and Parabolan. Initially used in veterinary medicine to increase appetite and increase muscle mass in livestock. Available in the form of esterified derivatives. The ability to bind Trenbolin Alpha Pharma is great, and is 5 times higher than that of testosterone. Steroid is one of the most effective in terms of gaining muscle mass and increasing strength. In this case, it is impossible not to note the high frequency of adverse reactions, especially in cases of incorrectly selected dosages and exceeding the duration of the course. Trenbolone has gained popularity largely due to the fact that it has no estrogenic activity, and is not subject to conversion under the influence of aromatase. Thus, athletes excessive accumulation of fluid and gynecomastia does not occur. Suppression of production of own testosterone occurs due to the presence of progesterone activity and a feedback mechanism. Often users experience atrophy of the testicles, sluggish erection and decreased libido. Given that Trenbolone is a 19-nor derivative of testosterone, in terms of progestin activity, it has much in common with nandrolone. Steroid can bind to progesterone receptors, which causes the occurrence of gynecomastia and a significant decrease in libido. 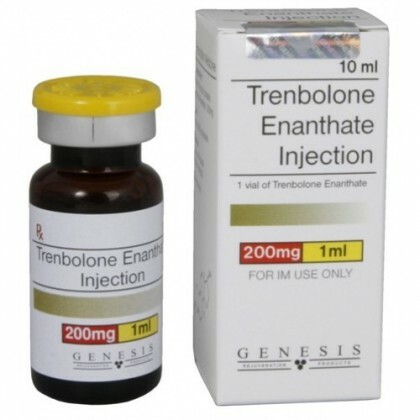 The time of detection of Trenbolone acetate and enanthate in doping control is up to 5 months. Significant increase in muscle mass. Solo course of trenbolone drug allows you to gain up to 10 pounds. Reduction of body fat. The effect is enhanced by stimulating the production of growth hormone. Increased sexual desire and libido on the course. After discontinuation of the drug, the level of secretion of own testosterone is significantly reduced. Two-fold increase in insulin-like growth factor.